"Assessing opportunities for enhanced integration of the associate members of the Economic Commission for Latin America and the Caribbean"
As a preliminary phase of action in response to the ECLAC resolution which calls for greater inclusion of the associate members in the work of the Commission, this study sought to accomplish three outcomes. Firstly, the study explored the common development challenges of the non-sovereign associate members (AMs) of ECLAC which served as impediments to the economic and social development of the AMs, and identified priorities which fostered and advanced their development aspirations. 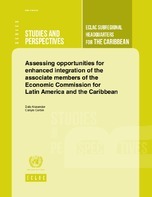 Secondly, in light of the recent incremental changes in the political status that had occurred in many of those territories, affording them greater autonomy and freedom to independently engage with regional neighbours on issues of common interest, the study mapped strategic options that were available to enhance their level of integration with regional and international organizations active in the Caribbean subregion. Moreover, the study documented the development mechanisms that could be leveraged to facilitate the continued development of the AMs, and proposed opportunities for enhanced collaboration through South-South cooperation and other collaborative mechanisms with neighbouring member States. Finally, while acknowledging that the AMs shared common needs, including challenges related to climate change and natural hazard vulnerability, heavy reliance on fossil fuel, and limited institutional capacity, the study recognized that their individual circumstances were unique. In that regard, the recommended actions took that into account, exploring options for the design of a strategy of programme support to accelerate their economic and social progress. Importantly, the study identified opportunities to further integrate the AMs into ECLAC’s programmes of development support. Abstract .-- Introduction .-- I. Associate membership within ECLAC .-- II. Common development needs and priorities .-- III. Regional integration and opportunities for enhanced collaboration .-- IV. Conclusions and recommendations for strategic intervention.